Are Sean Spicer's White House Press Briefings a Thing of the Past? President Trump is considering reducing White House press secretary Sean Spicer’s public role and he is no longer expected to do a daily, on-camera briefing after the president’s foreign trip, according to Politico. Citing “several officials familiar with the president’s thinking,” Politico reported that Trump is also considering shaking up his entire communications team as several ongoing scandals continue to make news on a daily basis. Last week, Trump threatened to cancel all future press briefings “for the sake of accuracy” in an early morning tweet. “I think he’s a little dismayed, as well as a lot of people that we come out here and try to do everything we can to provide you and the American people, with what he’s doing on their behalf, what he’s doing to keep the nation safe, what he’s doing to grow jobs and yet, we see time and time again an attempt to parse every little word and make it a game of gotcha,” Spicer said when asked about Trump’s tweet last Friday. Trump recently offered an extremely mild endorsement of Spicer during an interview with Fox News host Jeanine Pirro, who asked Trump if Spicer will continue to be his spokesman “tomorrow” during an interview that aired on Saturday night. 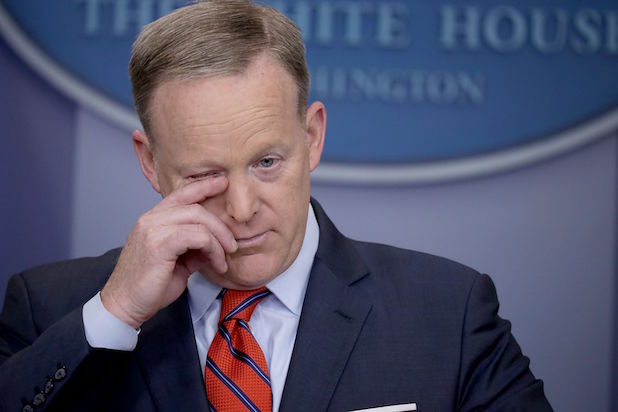 Spicer has emerged as a household name because of his often-combative press briefings and high-profile gaffes. 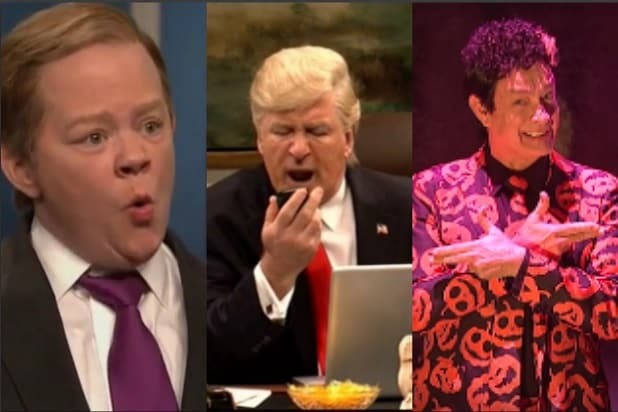 He is famously portrayed on “Saturday Night Live” by Melissa McCarthy and Spicer’s daily briefings have become must-see TV for political junkies. Fox News host Kimberly Guilfoyle recently told the Bay Area News Group that she is in conversations with the Trump administration about potentially joining the communications team, but the White House has pushed back on her comments.